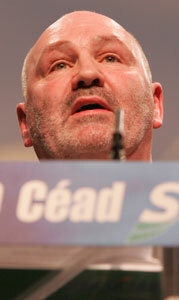 ALEX MASKEY, South Belfast Sinn Féin MLA, has written to Ian Paisley, Martin McGuinness and An Taoiseach Bertie Ahern and Dermot Mannion, the Chief Executive of Aer Lingus, to highlight his concerns that Aer Lingus staff to be based in Belfast could be employed under less advantageous terms and conditions than their counterparts in the 26 Counties. The South Belfast MLA has urged all concerned to work to ensure that this does not become the case. “I am extremely concerned by the decision to employ staff to be based in Belfast under different, and it seems, disadvantageous terms and conditions. “Jennifer McCann MLA and myself have discussed this matter with Aer Lingus staff representatives and other party colleagues. I believe that it would be most unfortunate if such a positive development as the location of an Aer Lingus base at Belfast International could be marred by the company’s decision to treat the workforce less favourably”. Maskey believes that discussions are ongoing between Aer Lingus management and staff representatives on the issue of workers’ terms and conditions.